Sally and John Clarke replaced a draughty kitchen with an ultramodern kitchen-diner and living space that’s comfy, welcoming and full of light. THE RIGHT DESIGNER Sally and John approached several companies for quotes and settled on design and build company Plus Rooms (plusrooms.com), a family run business specialising in extensions. ‘We liked its eye for detail and the fact that it would take care of everything for us – from applying for planning permission to building the extension and completing all the finishes: says Sally. ‘Both John and I work, so the idea of running a building project in our spare time was just too daunting.’ Plus Rooms drew up plans for a contemporary design with a pitched roof, frameless skylights and bifolding doors that extended the whole width of the house into the back garden. Plus Rooms created a graphic 3D model of the space, so the family could visualise how it would look. Once they had agreed on the details of the design, the couple had to wait for planning permission to be granted and party-wall agreements to be signed by their neighbours on both sides before construction work could begin. STATEMENT GLAZING The dining room doors, which used to overlook the side return, now open into the kitchen-diner, and the stained-glass panels above them were also used. The open-plan space is flooded with light thanks to skylights and a wall of bifolding glass doors that open out onto a terrace in the back garden. 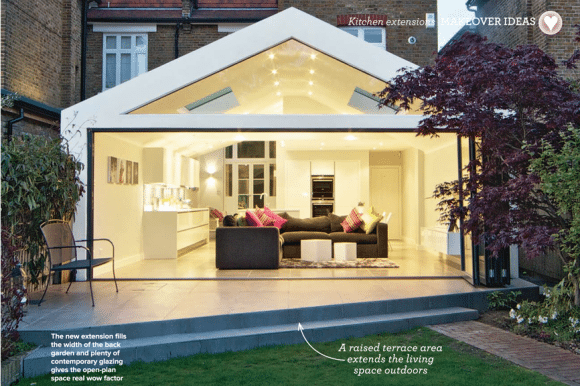 The triangular terrace was designed to echo the shape of the window above the bifolding doors. ‘There’s real attention to detail, and all the guttering is concealed to create clean lines: says Sally. Once the shell of the extension had been completed, Sally and John liaised with kitchen company Braverman Kitchens about the design of the cabinets and worktops. Choosing the size of the expansive kitchen island proved a major concern, so the couple tested out newspaper mock-ups on the floor to help them decide on the right dimensions. FAMILY FEATURES In the living area, the same careful planning is evident, with a recess in one wall to accommodate a flat-screen television and speakers that sit flush within the ceiling. ‘We wanted to put a sofa and a TV beyond the kitchen, so there’s space for the kids to do their homework and a place where we can all hang out: says Sally. ‘It’s now where we spend most of our time as a family.’ Underfloor heating beneath ceramic floor tiles ensures the new space is warm and inviting during the winter, unlike the family’s old kitchen. The open-plan space also has an integrated music system, which is ideal for entertaining. ‘We had a party to celebrate our 10th wedding anniversary and it was lovely to have the back doors open so that people could wander out to the garden: says Sally. The key was to insulate thoroughly and use high-performance glass that adds the wow factor while ensuring that the space maintains a comfortable temperature. Their windows and doors are made from double-glazed, toughened, self-cleaning glass. 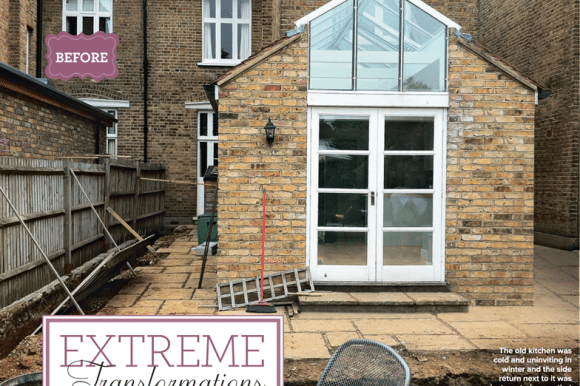 Installing glass bifolding doors across the width of the extension with a large piece of triangular glass in the gable roof above them created a striking feature. Three large frameless skylights illuminate the kitchen and living area with natural light. 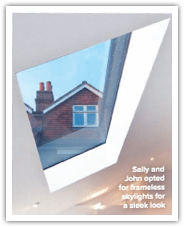 Sally and John paid £3,000 for each of their frameless skylights.